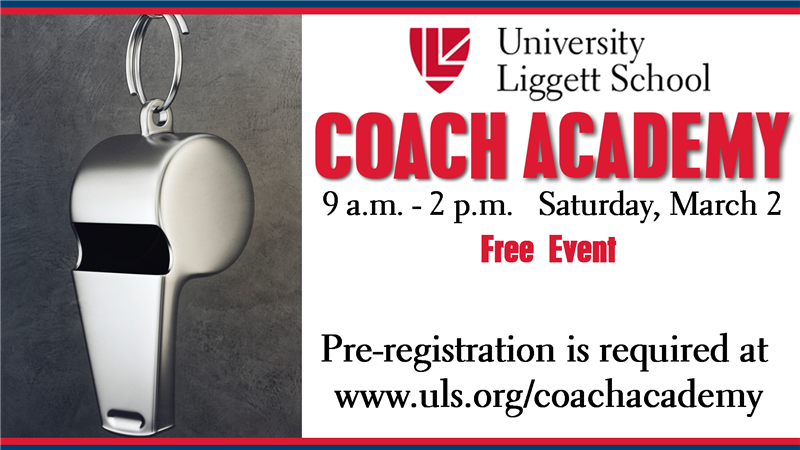 University Liggett School will host Coach Academy for metro Detroit youth sports coaches on March 2. The free seminar is presented in partnership with the Positive Coaching Alliance (PCA) and the Michigan High School Athletic Association (MHSAA). The goal of Coach Academy is to help youth sports volunteers gain a better understanding of best practices in coaching strategies and tactics to provide athletes with a positive and engaging athletic experience. Led by University Liggett School’s athletic staff, the PCA and the MHSAA at the school’s state-of-the-art sports facilities, the morning session features “The Power of Double Goal Coaching” presented by the PCA. A lunch keynote, “The Importance of Sports Diversification,” will be presented by the MHSAA. Afternoon Learning Labs will explore baseball, golf, lacrosse, soccer, tennis and track and field coaching techniques, as well as a general youth athlete conditioning session. Credentialed staff will also offer CPR certification, for a $37 fee. Registration for the workshop, along with additional information, can be found at www.uls.org/CoachAcademy. Those interested in speaking with someone to learn more about Coach Academy may also call 313.884.4444, extension 370.